New England Electricity Demand: How Low Can You Go? On May 1, 2017, ISO-NE released CELT 2017, its latest forecast for electricity demand in New England. As the independent system operator, ISO-NE is responsible for coordinating electric generation and sales in New England and for ensuring the reliable operation of the region’s electric grid. Each year, the ISO releases a 10-year forecast, which, in addition to being used by the ISO itself for internal system planning, is also used by state agencies, electric utilities, and advocacy organizations to estimate future demand for electricity. The CELT 2017 forecast includes estimates of annual energy use, winter and summer peak demand, energy efficiency, and distributed solar from 2017 through 2026. 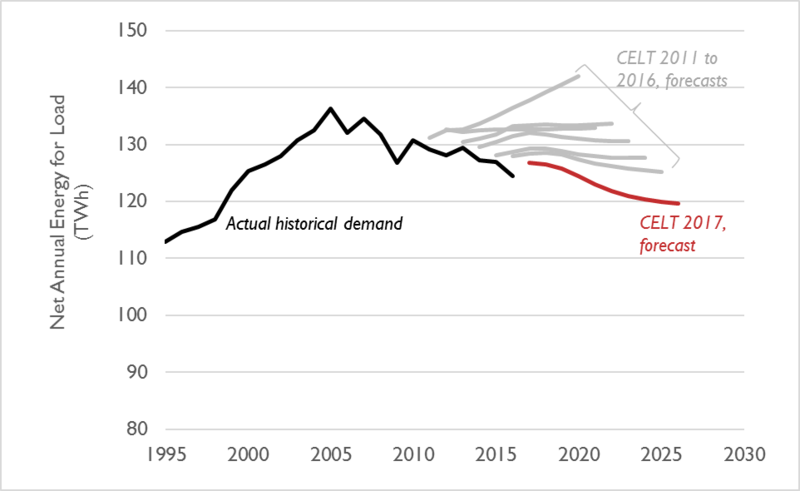 In the most recent CELT forecast, ISO-NE estimates that over the next 10 years, the annual demand for electricity will decline by 0.64 percent per year, on average (see Figure 1). This is a steeper decline than was estimated in CELT 2016 (-0.25 percent per year) or CELT 2015 (-0.04 percent per year). In fact, the ISO’s forecast for energy has dropped lower and lower each year for the past five years. This decrease in electricity demand is driven by three main factors: (a) general shifts in population and the economy, (b) increased deployment of distributed solar, and (c) increased deployment of energy efficiency measures, such as high-efficiency appliances, insulation, and LED lightbulbs. Because of these changes to the electric system, 2016 had the lowest observed annual electricity sales of any year since 1999. These and other rapid changes to the electric industry make load forecasting more difficult. In the latest CELT forecast of energy sales, ISO-NE increased its estimates of how much distributed solar would be in place by 2025 by 40 percent and its estimates of how much energy efficiency would be in place by 2025 by 10 percent, compared to last year’s forecast. It might still not be enough. ISO’s estimates of future distributed solar and energy efficiency have known deficiencies, including problematic assumptions regarding the discounting of state policy requirements, future technology costs trends for both solar and efficiency measures, disappearance of tax credits, and other state-specific incentives. Underestimating energy efficiency and distributed solar could lead to overstated forecasts for electricity demand, possibly resulting in unneeded investments in new power plants, transmission projects, and natural gas pipelines. In recent years, Synapse has calculated its own forecast for energy efficiency and distributed solar, as published in the 2015 report Challenges for Electric System Planning. Synapse will continue to examine CELT 2017 and looks forward to publishing updates to its New England energy efficiency and distributed solar estimates in the coming months. Decarbonization of Heating Energy Use in California Buildings - New Report! Can Clean Energy Replace California Oil Production? What's in Storage for At-Home Batteries? 11 big ideas in the Massachusetts Senate's "An Act to Promote a Clean Energy Future"
Synapse Welcomes Nina Peluso and Jamie Hall! Decarbonizing the Northeast: It's (Strategically) Electrifying! Coal Power's Competitive Edge? Politics. The Access Northeast Pipe Dream? Synapse Welcomes Asa Hopkins and Danielle Goldberg! Delaying the Clean Power Plan: Who Pays for the Stay? Does Energy Efficiency Have a Role in Mass-Based Clean Power Plan Compliance? Can We Afford to Transform Our Grid? What Should We Make of the Supreme Court MATS Ruling? For media inquiries, please contact our communications team. Sign up to receive alerts when new articles are posted. If using Google Chrome, you will first need to add the RSS Feed Reader extension.